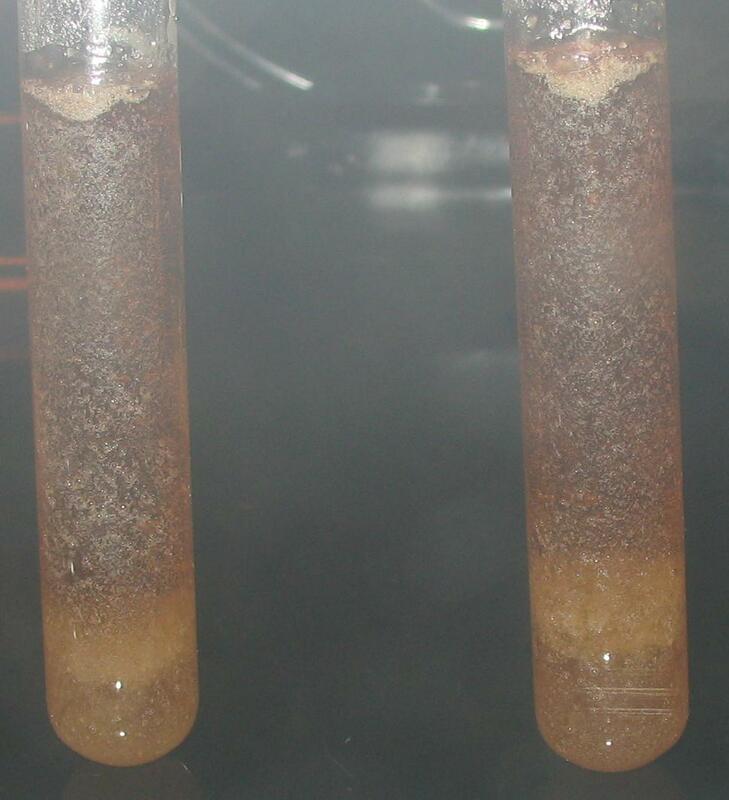 Summary: the task is to melt in the oven KNO3-NaNO3-sorbitol 35-30-35 propellant without stirring until complete dissolution of nitrates. 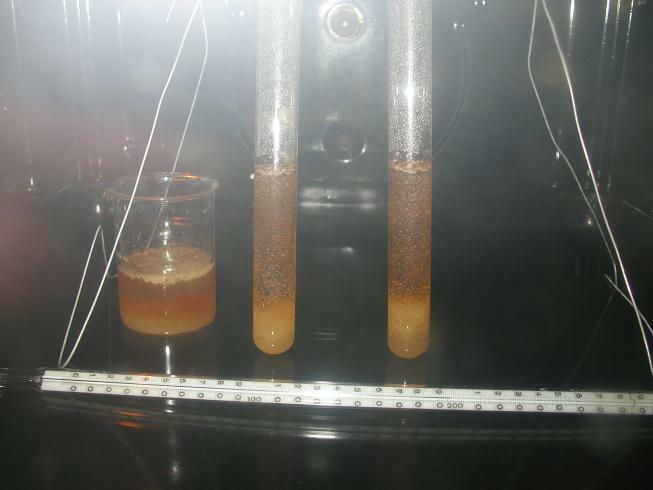 KNO3:and NaNO3 reagent grade "pure for analysis". Moisture content 0.1-0.2%. 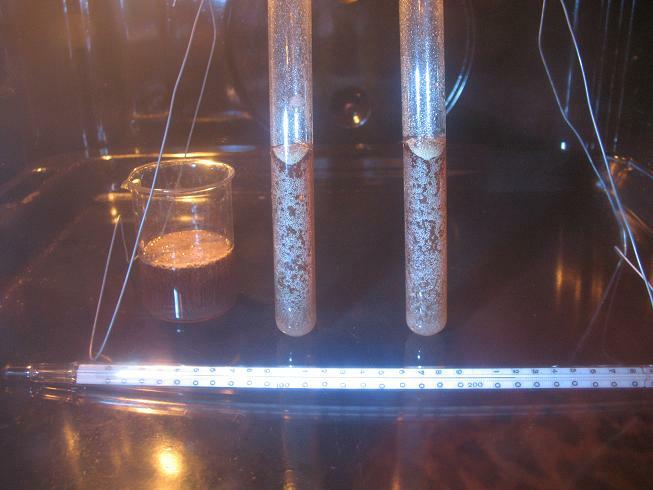 They were milled together with coffee mill, crystals measured 50 microns to 300 microns. Sorbitol: pharmaceutical grade. Moisture content 0.2-0.3%. 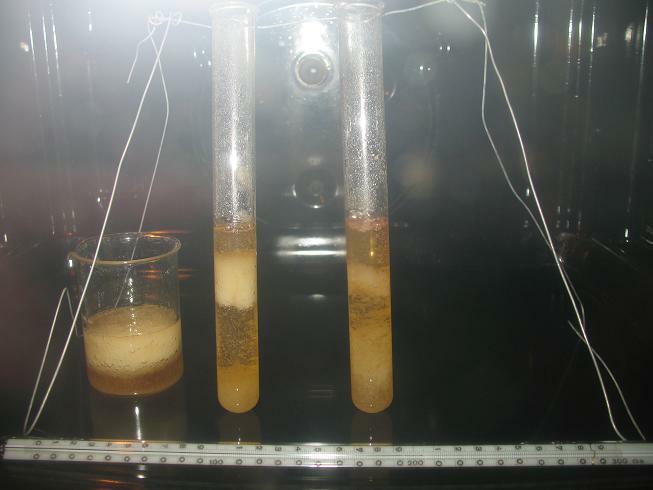 Three samples were prepared for melting, they were placed on a baking sheet in the oven (not on the bottom of the oven). Electric oven with effective temperature controller was used. Temperature was measured by the thermometer placed on a baking sheet. 1. 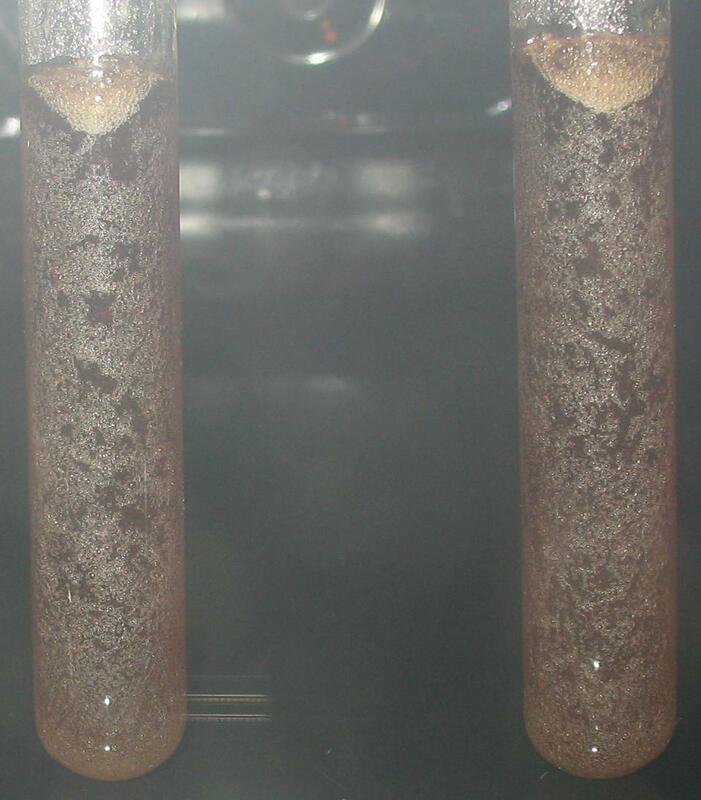 50 g batch of thoroughly mixed powdered KNO3-NaNO3-sorbitol propellant mixture was placed in glass beaker. 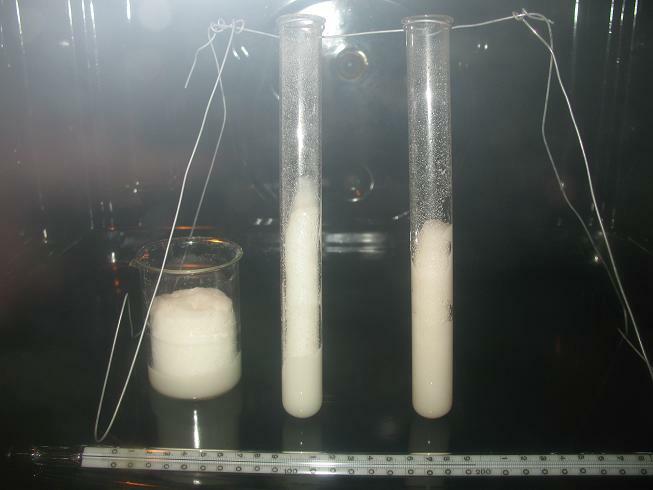 Height of powdered mixture is 5 cm. 2. 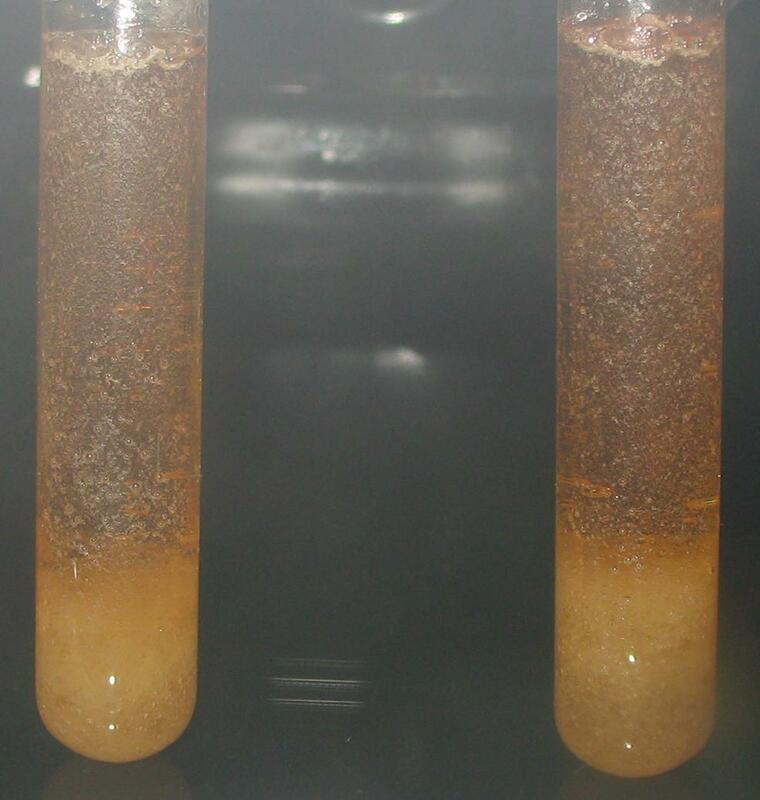 20 g batch of thoroughly mixed powdered KNO3-NaNO3-sorbitol propellant mixture was placed in glass test tube. Height of powdered mixture is 14.7 cm. 3. 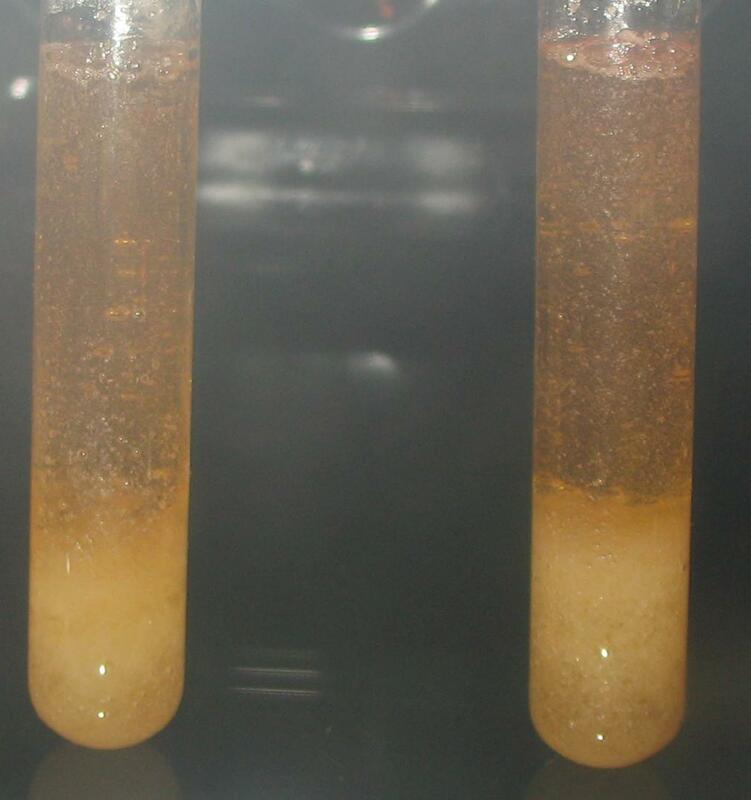 20 g batch of thoroughly mixed unmilled KNO3-NaNO3 (crystals' size is about 0.5 mm) +sorbitol propellant mixture was placed in glass test tube. 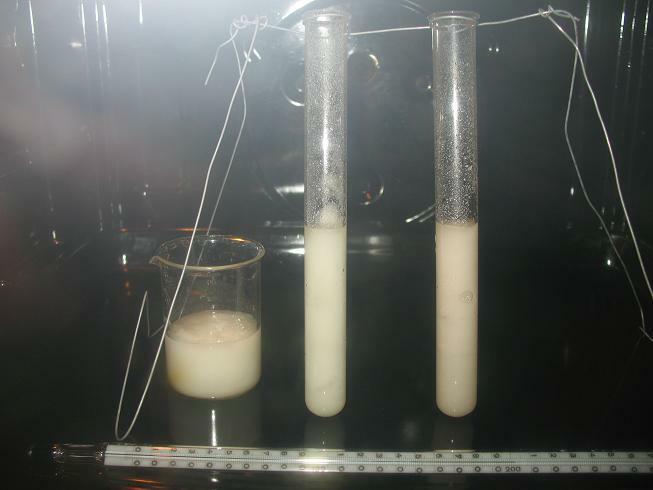 Height of powdered mixture is 14.3 cm. 10 min, 170C. 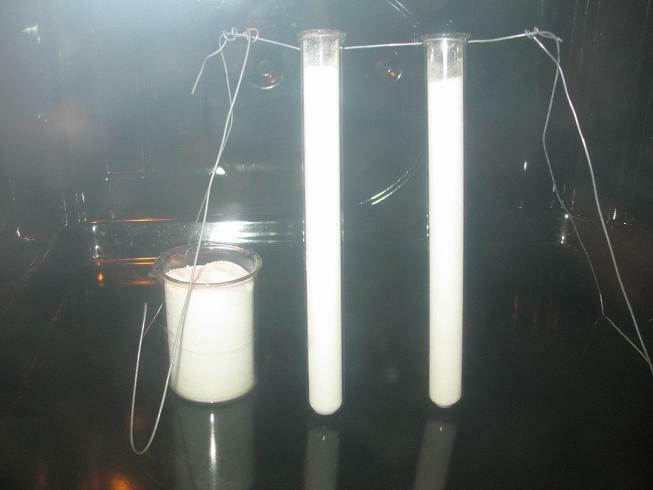 Sorbitol starts to melt. 13 min, 195C. Almost all sorbitol melts. 20 min, 202C. All sorbitol melts. 25 min, 204C. 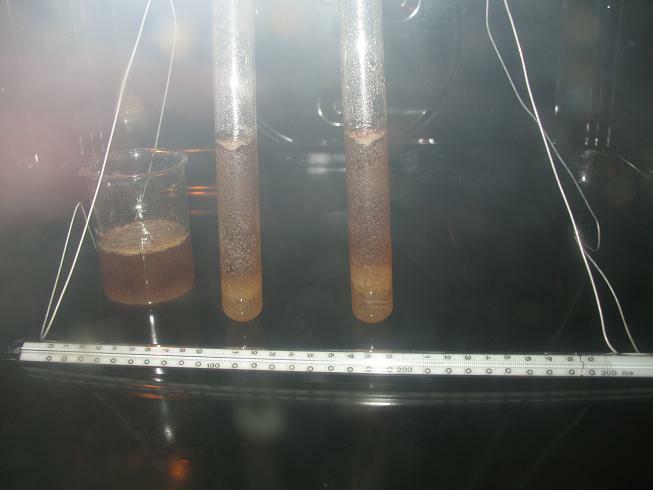 Dissolution of nitrates becomes appreciable. 35 min, 205C. 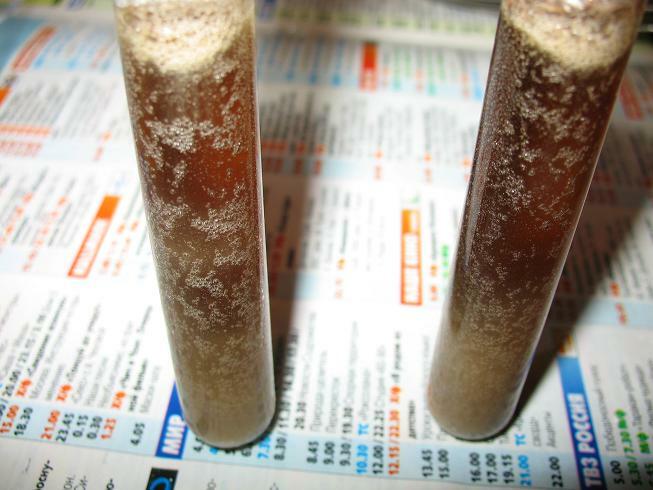 Separation of nitrates starts in the right test tube with unmilled nitrates. 40 min, 204C. 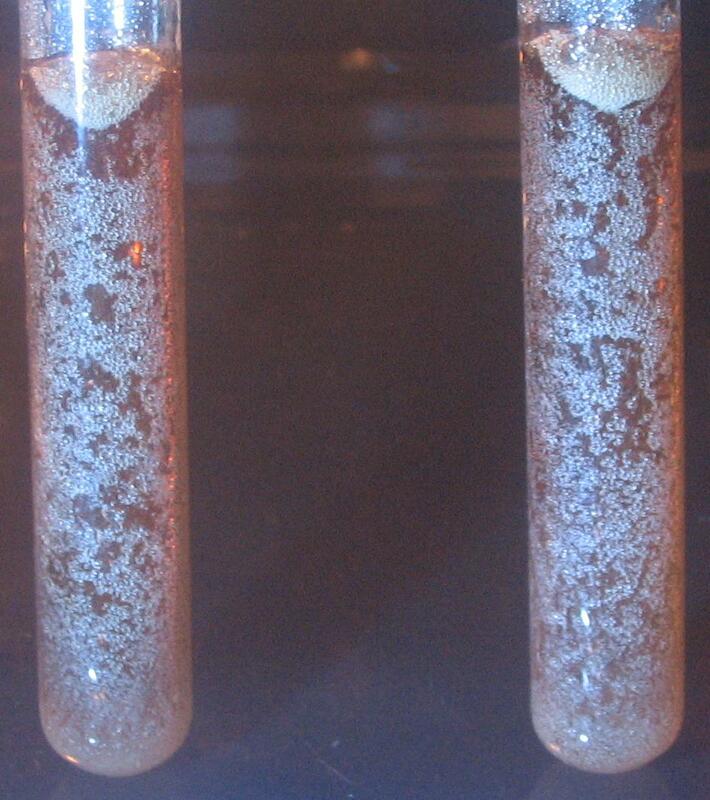 Separation of nitrates starts in the beaker and left test tube with milled nitrates. 45 min, 203C. 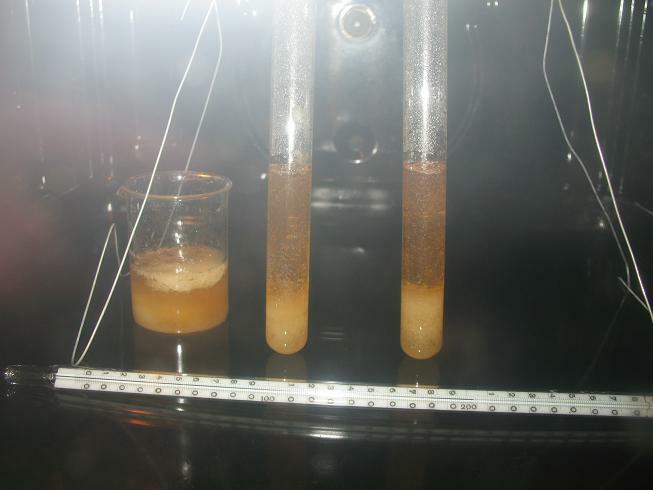 Separation of nitrates to the bottom occurs in all three samples. 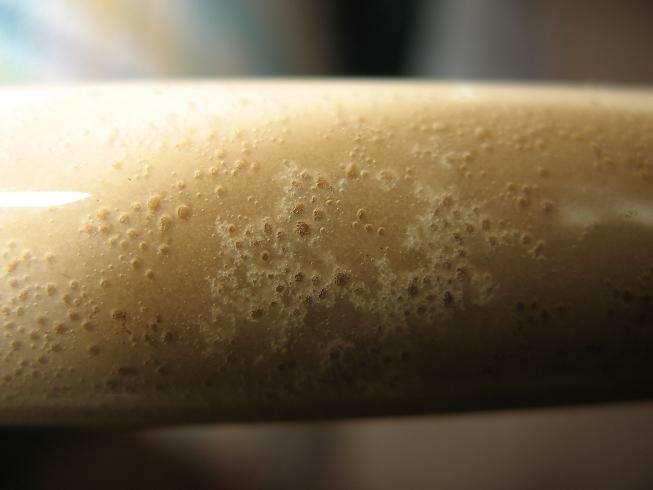 Glass surface above the crystals starts to cover with bubbles, presumably due to decomposition of sorbitol. 1h, 200C, without changes. 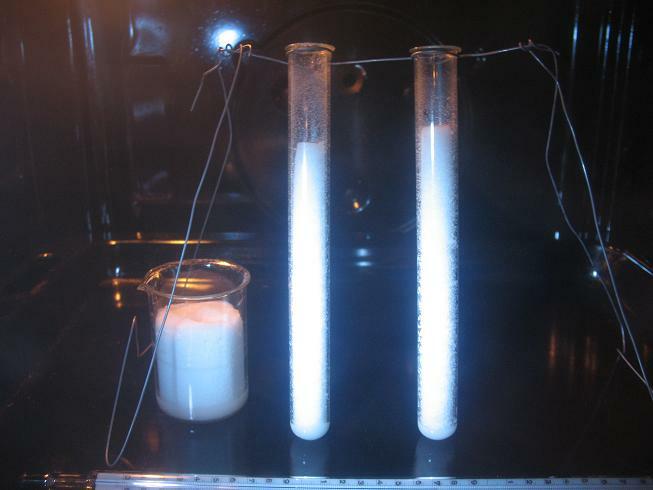 It is clear that at this temperature propellant will not melt completely.So I start to increase temperature. 1h 10 min, 220C. 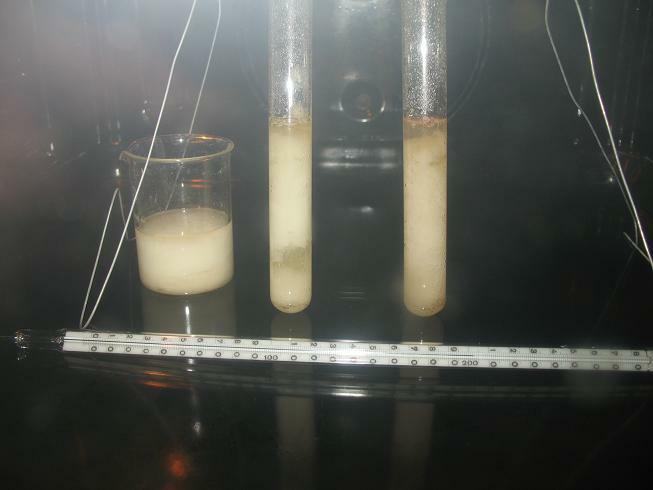 Dissolution of nitrates at the bottom starts. This temperature is very close to the melting point of KNO3-NaNO3 eutectic - 220-225C (from different sources). 1h 20 min, 223C. 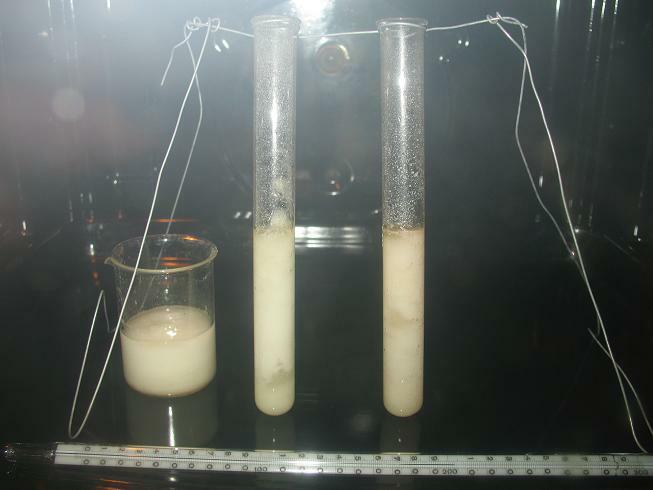 Complete dissolution of nitrates is achieved. All glass surfaces is covered with bubbles. The same point with other illumination. 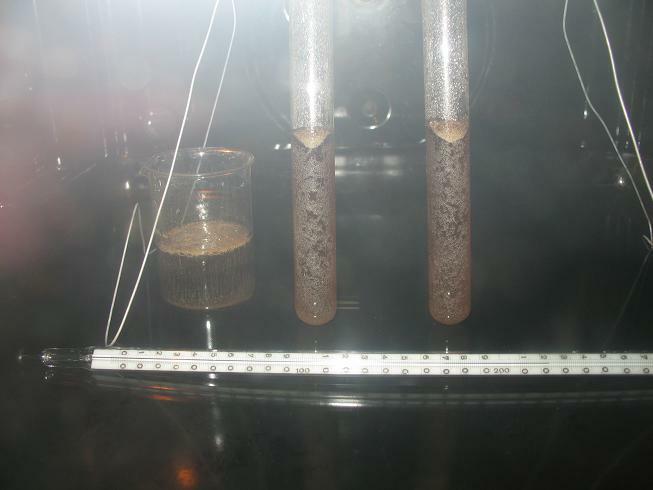 After withdrawal from an oven bottom part of melt solidifies very quickly, during 5-10 seconds. 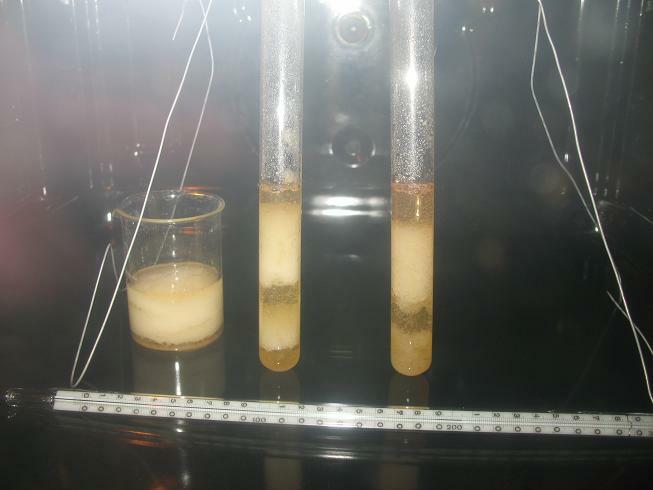 It indicates that this layer contains larger proportion of nitrates, than upper layers. 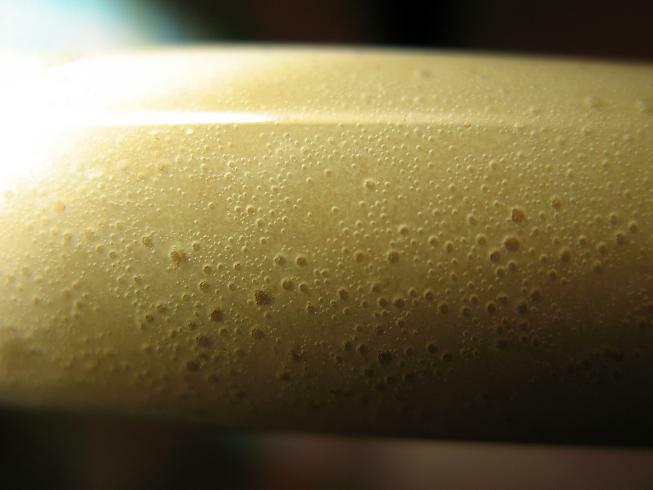 Solidified propellant is covered with bubbles.